Three months on from the deaths of my parents, a week out from my daughter’s wedding, I finally get back to this cloth tote bag, thoughtfully provided by the funeral home, emblazoned with its logo. I tossed into it, weeks ago, funeral materials, death certificates, a folder of hospice papers, and two big bundles of sympathy cards. About a third of them were never opened. So I start opening them now. Most of them are cards for my mom, expressing sympathy over the loss of her husband. She was too ill, after my dad’s funeral, to bother with them, and they got swept into her apartment, then into her hospice room, and then into this bag. I can’t remember exactly how. Some of them are for me, sent after my mother’s death. I suppose they are in this pile because they were sent to my mother’s address, from friends of hers who did not know my address. Here’s one from her friend Geri, another from her friend Shirley. Here’s one from her neighbor in the apartment across the hall. I skim over the printed religious sentiments and focus on the handwritten notes, the Christian sympathy and encouragement that every one of these people expresses with simple eloquence. I linger, too, on the brief quotations from the Psalms printed on the card or written in. I miss Dot! We did most of our visiting between rooms 232 & 234 where our husbands received their care. There is something about passing through similar valleys that draws the hearts together. One evening I shared with her that I had just had the privilege of praying with one of our friends who was “slipping away.” Her comment was, “Some day if that happens to me, I’d like to have you around.” I’m sure we both thought—not likely. However, God’s ways are not our ways. Every evening [she means when Mom was in hospice] I stopped in to quietly stand by her bed & pray. Only once did I identify myself. God was hearing the prayers & fulfilling her wish. It has been such a privilege to know Dot for even a short time. Another sweet grace. I marvel at the gathering of holiness represented by these cards. I marvel at the network of people in my parents’ community, old friends and new, each one of them somehow equipped to minister to others, when needed, with words of scripture, heartfelt prayer, shared pain suffused with Spirit-filled assurance. How does such a community come to be? How is it sustained? In Richard Rodriguez’s memoir, Hunger of Memory, he recalls his Catholic upbringing in Northern California, and he remarks that for his working class, Mexican immigrant parents, the church was the only institution “aware of the fact that my mother and father are thinkers,” people who could “dwell on the meaning of their lives.” I think of that as I read through these cards. They are from my people-of-origin, the West Siders of Grand Rapids, tradespeople and teachers, small business owners and nurses. However ordinary, these people were taught by the church how to encounter life’s greatest mysteries with honesty, hope, and grace. They have a depth, it seems to me, that eludes the secular sophisticates of our world. Later, working my way through my parents’ lockbox, I find their marriage license, birth certificates, and a brochure from the cemetery where they pre-purchased their grave sites. Judging from the typography, the brochure was designed about 1980, but I know, because I have the documents, that Mom and Dad purchased their sites in 2001. I suppose Harvey J. Beute, Family Services Coordinator (his card is stapled to the brochure), felt no urgent need to update his brochure’s design to keep up with trends. 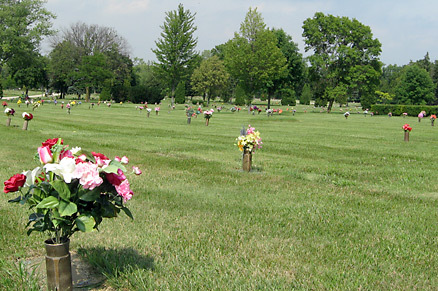 A final resting place for loved ones who have passed on. Nothing more. Nothing less. Yet, to many, it becomes a place where propriety is replaced by pomposity. Where heaps of granite are mistakenly represented for feats of grandure. Where American affluence stands sentinel against simple respect. Not so at Washington Park Memorial Gardens. For this is hallowed ground for humble people. And has been since 1905. Various nationalities, trades, and creeds are represented under the massive shady oaks and statuesque pines which fill our landscape. And there is an aura of reverence and respect here which speaks to the final dignity of man in tones more hushed than any ostentatious mausoleum which stands aloof in the gleaming sun and green fields of a converted farmyard. What modern copywriter could abandon snappy bullet points and get away with this kind of grandiloquence? “Propriety replaced by pomposity”? “Stands sentinel against simple respect”? “Statuesque”? “Aura”? Honestly. The whole thing is too much. But I love it. Why shouldn’t humble people speak of the “final dignity of man” in hushed and gorgeous tones? I start sorting all the papers and files and cards into one large plastic bin that will go into the basement eventually. I put my mother’s fake alligator-skin wallet in there, funeral programs, a few photos. I’ll add more photos later, when I finally face all those family albums that wound up in my basement. And here is the big bundle of cards my own family received. Before placing them in the box, too, I look through them again, comforted anew by words of Christian hope, prayers for the Spirit’s strength, little scripture quotations. I can feel especially, almost palpable, the empathy of those who have known loss themselves. Cards from friends, colleagues, students past and present, many church people, people I barely know saying they are praying for me. And I know they are. I have long admired my parents’ Christian community, but here is fresh evidence that this gift has come to me, too. “My people” these days are often very different from my native West Siders. But they’re humble people as well, also taught by the church how to encounter life’s greatest mysteries with honesty, hope, and grace. Here, in these cards, is the hallowed ground we share. As my mother’s missionary friend would say, what a privilege.